Spend a peaceful day on the water. Soothe your sore muscles as you look out over the lake. Grab a blanket, pick a chair and get comfortable. Your full kitchen is ready when you are. Be sure to rent a jet ski, Red Wolf Lakeside Lodge is conveniently located on Lake Tahoe. Red Wolf Lakeside Lodge is the perfect spot for a weekend getaway. Red Wolf Lakeside Lodge has 2 outdoor hot tubs - try them both and pick your favorite. Take your mini-explorers out on the Brockway Summit Tahoe Rim Trail, 3 miles away. Brush up on your game at Old Brockway Golf Course, it's only a 6 min walk away. Awarded a Certificate of Excellence from TripAdvisor, Red Wolf Lakeside Lodge is located on Lake Tahoe’s North Shore. The quiet setting of the resort provides everything that you need for a peaceful and relaxing vacation. 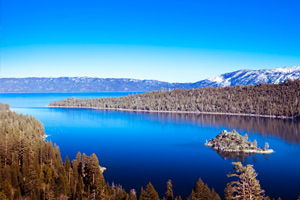 Enjoy the views from the hot tubs overlooking Lake Tahoe as you recover from the slopes. Or go for a swim in the outdoor pool, it’s heated seasonally. If the weather is cooperating, take advantage of the bbq grills for a family cookout. Recruit the kids to help carry burgers, hot dogs and side-dishes. Then lay out the condiments and toppings and let everyone go to town. The resort offers several daily activities, some which may require a surcharge. Meet fellow guests at the Welcome Breakfast on Mondays, build your own Sundae on Tuesdays (that will be a big hit with the little ones), unwind with a Chair Massage on Thursdays and recap the week’s best moments at the Root Beer Float Social on Saturdays. Red Wolf Lakeside Lodge has access to a private beach and pier, and kayak rentals are included in the price of your reservation. Spend a day on the lake, then return to the resort for an afternoon picnic. Studio condos sleep two guests and have a Murphy bed. One- to two-bedroom condos sleep four to six guests. All condos have full kitchens because sometimes a mini fridge just isn’t enough. It’s only a short walk to Safeway, bring the family along to make sure that nothing important is forgotten. (Remember: on vacation, snacks are very important). Get your caffeine fix at the Starbucks inside Safeway. Now the only question is: latte or Americano? When you return from the store, thaw out in front of the fireplace. In-suite entertainment includes a Flatscreen TV with cable; catch a rerun of Friends or The Big Bang Theory. DVD players are perfect for family movie night. Bring favorite movies from home or browse the selection available the resort’s DVD library, put one kid in charge of snacks and the other in charge of drinks. First kid to make it back to the couch picks the movie. Once the kids have gone to bed, enjoy a soak in your in-suite jetted tub. The worst part about coming home from vacation is all that laundry! Get out ahead of it and take advantage of the on-site laundry facilities at the resort; now all you have to do when you get home is unpack. Red Wolf Lakeside Lodge is a short drive to Tahoe Regional Park. There are five tennis courts available if you feel like getting your Serena Williams on. Tree Top Adventures features seventy tree platforms, connected by zip lines and bridges. Safety is their number one priority which is why everyone who participates wears a climbing harness and is connected to a safety cable. Kids will love the playground, for children aged five through twelve. It features hanging bridges, slides, and spring rider play equipment as well as swings for both little and big kids. Kings Beach Miniature Golf features two 19-hole courses and is a short drive from the resort. Northstar California Ski Resort is less than eight miles from the resort. Skiers of all experience levels are welcome. The Village at Northstar features several places to stock up on apparel and accessories. Butterbox has everything you need for snowboarding, Elite Feet offers custom boot and ski fitting, and The North Face has apparel and footwear for outdoor enthusiasts. - The front desk is open daily from 8:00 AM - 6:00 PM. Guests are planning to arrive after 6:00 PM please contact the property in advance using the information on the booking confirmation. Guests are asked to proceed to the resort front door where a sign for late arrival instructions is posted. Guests should pick up the red phone to the left of the front door; which will call the answering service providing the code for the key packet in the lock box.